The thriving adventure breaks market is expected to create 1,000 new jobs in North Wales over the next five years. According to Tourism Partnership North Wales, the region is well placed to take advantage of the increasing popularity of outdoor activities. 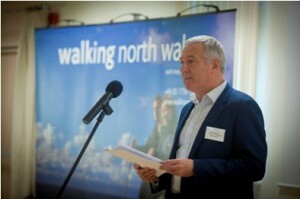 Mr Davies was speaking at the first Outdoor North Wales Forum in Llanrwst for both the walking and adventure sectors which sustain 350 businesses. The aim of the forum organised by Tourism Partnership was to showcase innovative technology and help operators raise standards to promote their businesses both individually and on a regional basis. Delegates were also given a sneak preview of new technology that could soon make the mountains of Snowdonia a safer place for walkers as well as enabling them to learn more about the area. Smart Phone users will be able to download an “application” describing in fine detail most of the popular walks, along with maps and information about local places of interest. The “app” will be launched very soon by the Snowdonia National Park Authority and will be free of charge. John Ablitt, the Authority’s Director of Communications, explained that the “app” will enable people to access a huge range of information about the park and its attractions and make it clear to people planning to walk in the mountains for the first time exactly what to expect. “We have half a million people walking on Snowdon each year and we want to ensure that they get the correct information in the most modern way. We have put a lot of thought into this because we believe it is the way forward,” he said. Mr Ablitt said he believed that there would still be a market for traditional guidebooks but accurate new services like the “app” could see an end to those containing vague and, in some cases, dangerously inaccurate information. Guest speaker at the opening of the forum was Squadron Leader Iain “Spike” Wright, of 22 Squadron RAF Valley, who spoke on the role of the helicopter crews in mountain and sea rescues, which represented 99% of their work. Topics also covered included the growing importance of new technology such as social networking sites in promoting businesses, the need to develop skilled and motivated staff, advice on insurance and ways in which North Wales could benefit from the growing number of cruise ships visiting the area. One of the keynote speakers was Karen Plumb, Commercial Director with Trip Advisor, the travel social media website which has come under fire from many tourism operators for carrying damning reviews of their premises or services. In her address, titled “Friend or Foe”, she said the vast majority of people now went on-line when planning to travel and review sites like Trip Advisor were proven to be hugely influential. And despite the fears and concerns of operators the average score awarded on Trip Advisor was 3.5 out of a possible 5, she added. She urged operators to respond positively and professionally to consumers’ comments, thus turning the situation to their advantage. “The future is digital – be part of it,” she added.